Busy is the only way to describe my life lately, and I don't expect things to change for a few weeks. Nevertheless, I really want to keep up an "every-other-day" blogging habit. So.... *deep breath*... here I go for today. Erik and I went to Bernice's this morning. Bernice's is a weekend ritual for us (sometimes both days), but I've been working late nights and missing dinners so breakfast has become a favorite time to spend with him - I plan to sprinkle in as many Bernice mornings as I can. Why Bernice's? I really don't know. There's no WiFi, which I hate. There's no microwave so you have to wait a long time while food gets heated in the oven. There's no espresso. It's often crowded, and you often have to share tables. So why Bernice's? Run through that last list again, and there's why. There's no internet so people really talk - or read the paper or book or some other such antiquated passtime... There's not really an upside to no microwave though excluding the inconvience, that's pretty quaint. You can end up sharing tables with really interesting people. And, if all that weren't enough, the bakery is in an old brick building on a quiet, but not out-of-the-way street. Sometimes Erik and I can walk from my house. If it didn't feel homey and quaint already, we've been there so much that it certainly feels that way now. My favorites are the cinnamon roll, but there is SO much sugar that I often go for the muffins - vegan blackberry peach, lemon blueberry buttermilk, or blackberry bran... Today I had a cinnamon nut croissant which was delicious! Today I also had to read a book about composting. Yes, I said "had." I brought my new Scott Kelby Photoshop book, but Erik, in response to my deep desire to compost, brought a different book to look at and discuss. See, even though it's "catch-up and chat" time, it's also "catch-up and plan" time. And it's time to start planning the compost pile/barrel/container/pen. I'm normally in favor of the do-it-yourself option over all others, but I have to admit, I have no desire to learn about composting. I just want something that works. I just want to collect my kitchen scraps and feel good about them going back into the garden. I want to use as few fertilizers as I can, but still produce substantial... um... produce. So, Erik got this book titled, "Compost." Clever, huh? What was also clever was the way Erik presented it to me. "It's like a flip book. It's the only one from the library that had pictures." Wow, you can tell a guy thinks highly of you when he selects books based on whether or not they include pictures. So, I flipped, I scanned, and I still have no idea what I'm going to do. 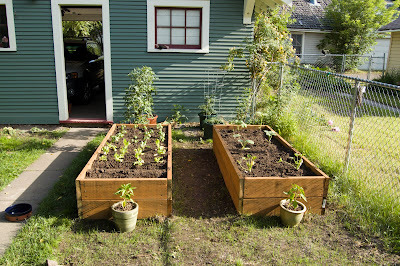 I have about ten minutes left, so right now, I'll post some pictures of the raised beds from last year. They're full of eko-compost (that stuff is like gold. I'll share more about it later.) 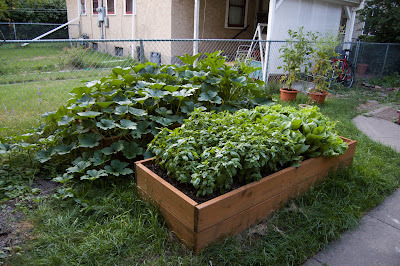 One bed has zucchini and pumpkins and the other has basil, lettuce, and peppers. The pics are pretty big, but I'll resize them later.